Some fruits are just meant for picking and eating, there and then, in the garden. Alpine strawberry (Fragaria vesca) is one, with its tiny, sweet, ever so slightly vanilla flavoured fruit that are doled out carefully throughout the summer. 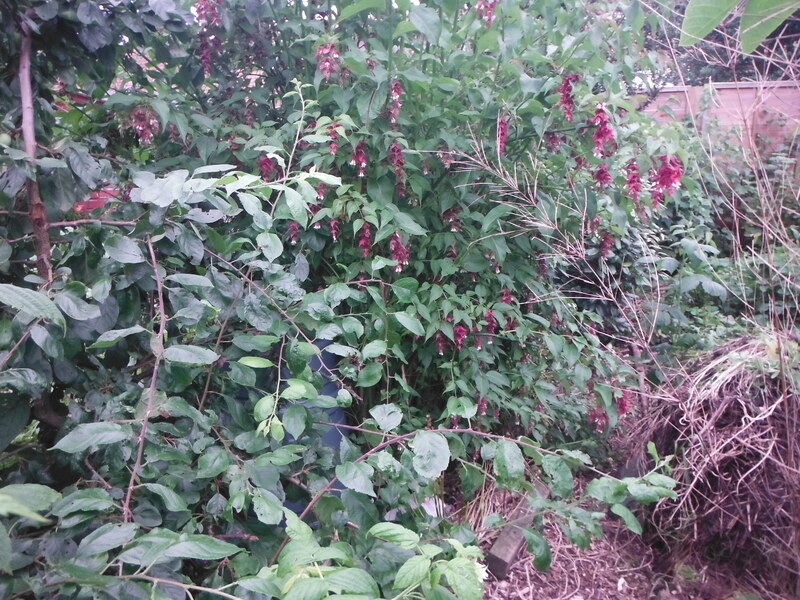 But the king of instant consumption has to be Leycesteria formosa, known to gardeners as Himalayan honeysuckle and to connoisseurs as the ‘treacle tree’. No plant in the forest garden divides opinion like leycesteria: you either love or hate its startling mixture of molasses sweetness and bitter aftertaste. But however much you like it, don’t expect to take any home – the berries burst and splat so easily that storage is practically impossible. Foods that you’ll never see on a plate have a special allure, but even some more common fruits are best eaten one by one, on the go. 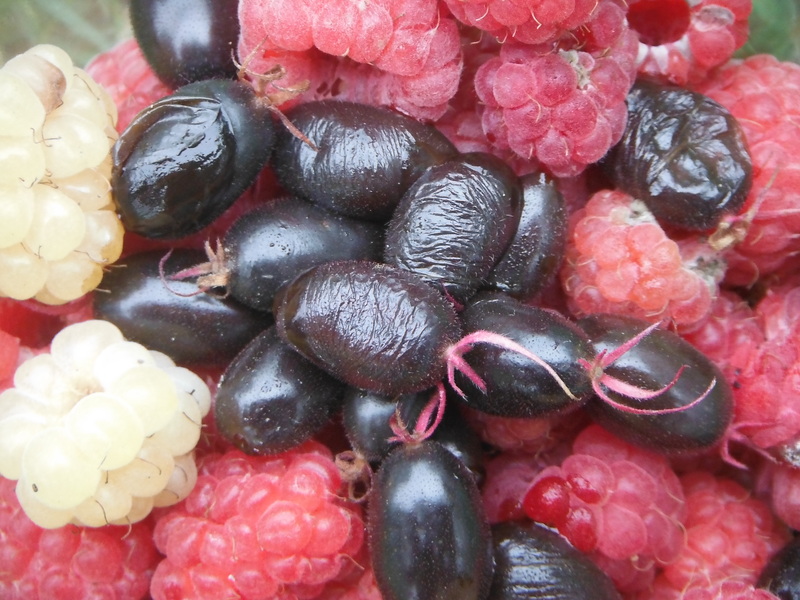 Blackcurrants and gooseberries, for instance, are at their best when they are far too soft and squishy to be picked and stored easily. My treacleberries kicked off a conversation recently about planting food plants for children. Instead of coaxing kids to eat their five-a-day at the table, how much more effective to just plant a tangle of fruit in the garden and leave them to it, play and feeding all in one. I’m sure my love of fruit and foraging came from grazing on the yellow raspberries that lined the half-mile walk home from school. For maximum effect it is probably best to strictly forbid the kids to eat it. When I first started in my allotment, my neighbour’s daughter used to beg to be allowed to come down and eat the sprouting broccoli. I think that’s when the full extent of how much more appealing self-picked food is to kids dawned on me. I’ve taken this insight into the park that I manage, which is stuffed with as much fruit as I can fit in. 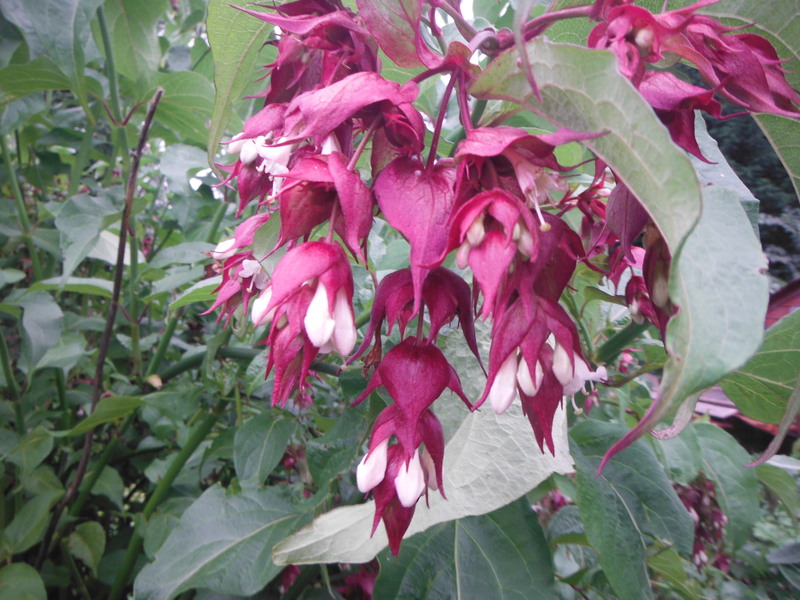 Leycesteria is an excellent option for a public food plant. It ripens its berries four at a time down the flower head, so it produces a regular supply rather than a glut that can be stripped. It is a very attractive, structural plant, sometimes known as ‘shrimp flower’ because of the look of their flowers, and any that don’t get eaten by people are made very welcome by the birds. This entry was posted in Reflections, Species and tagged forest garden, gardening, Himalayan honeysuckle, Leycesteria formosa, treacleberry, unusual foods. Bookmark the permalink. I just might try the berries this year!!! I have one of these in the garden in the way it will now be moved up tp the forest garden part of the allotment thank you for a great idea. I’ve always loved it as an ornamental, especially in winter with those sea-green wands, now I will check out the berries, too! I was looking this for a long time, and couldn’t remember its name. I bought one for my mother many years ago, and tracked it down today. i got the golden variety with paler flowers, and wonder if the fruits are edible. if only once. Hi Gina. Its natural range is given as the Himalayas and South China. The scientific name suggests a Taiwanese connection. It seems to set seed perfectly happily with one plant here, although I suppose it’s possible that it’s being pollinated by plants outside my garden. One caution: make sure it’s not listed locally as an invasive plant as the birds do tend to spread the seeds around. I thought that I would taste one as they are called Pheasant Berry. On biting a berry the acrid juice began to burn the back of my mouth and tongue. After a mouthwash and a swig of milk, I looked it up on Plants for a Future. Some forms are sweet and others are bitter. I have a yellow leaved form and I hope that is better.